This article is a short summary of Donkey Kong Country: Tropical Freeze. 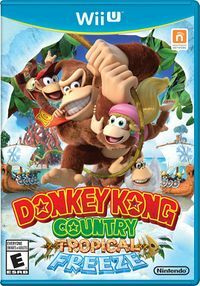 Donkey Kong Country: Tropical Freeze is the fifth game in the Donkey Kong Country series of games, created by Retro Studios in collaboration with Monster Games for the Wii U as a follow-up to the previous title, Donkey Kong Country Returns. The game was originally planned to be released in November of 2013 before being pushed back to December, and was later pushed back again to February 2014. Take back DK Island from arctic invaders! An adventure spanning six unique islands! Journey with Donkey Kong™ and friends as you explore lush jungles, sparkling waters... and ice-covered tropical islands!? Never-before-seen abilities and breathtaking camera angles combine to produce more dynamic gameplay. Cranky Kong™ and Dixie Kong™ join in the adventure! Mix and match with Donkey Kong for exciting single and multiplayer action! On Donkey Kong Island, Donkey Kong is celebrating his birthday with Diddy Kong, Dixie Kong, and Cranky Kong. Out at sea, however, is a group of vikings called the Snomads, who take notice of Donkey Kong Island. Blowing into a massive horn, their leader blows the four Kongs away and covers the entire island in snow and ice. Donkey Kong and friends must now travel across several islands to return to their home and reclaim it from the Snomads. As a follow-up, much of the gameplay is retained from Donkey Kong Country Returns. In addition to Donkey Kong's roll and handslap, players can now also swim through the water. Players take control of Donkey Kong, and can obtain Diddy Kong as a partner as well as Dixie Kong and Cranky Kong by breaking specially-marked barrels. Each of the three Kongs has their own unique abilities: Diddy can use his Rocketbarrel Pack to slow Donkey Kong's fall, Dixie can spin her ponytail to fly him up higher, and Cranky Kong can bounce on his cane. The partner character can also once again be controlled by a second player. Another new mechanic is the Kong POW, a special move that can only be performed by a partner that destroys all enemies on screen and turns them into an item depending on the partner. Like in Returns, within each stage are four "KONG" letters and a number of puzzle pieces to collect; the KONG letters unlock a bonus stage, while the puzzle pieces unlock extras. In addition, when a stage is beaten players can replay the stage in Time Attack to earn a medal and have their time posted on the online leaderboard. AUS: December 1, 2016 A re-release of the game under the Nintendo Selects line. JP: May 3, 2018 A direct port of the game to Nintendo Switch. This version of the game features a new "Funky Mode", allowing players to play as Funky Kong. 1.1.0 April 3, 2014 Fixes a bug in which the game will not progress to stage 3-4 after clearing 3-3 (also fixes afflicted save files). ↑ Nintendo Direct Mini 1.11.2018. Nintendo (YouTube; January 11, 2018). Retrieved January 11, 2018. This page was last edited on 13 October 2018, at 23:10.